There is no way that any one of us can live without food as that is where the body gets all its essential nutrients and energy in order to perform properly. It’s pretty much common knowledge that the digestive system is responsible for looking after that food once it enters your body. Once in the stomach, the food is broken down and turned into amino acids and protein. That is performed by acids which are unable to harm the stomach thanks to a protective membrane. If you were truly paying attention in school, then you probably remember your teacher talking about the esophagus, which is where the food passes through en route to the stomach. The esophagus has no protective layer which means it can be burned if acid is able to find its way there. When that happens, what you usually feel is heartburn. Heartburn is the first symptom of acid reflux, and if it is left untreated it can eventually become pretty severe. Regurgitation is usually next to follow, with the food that you just ate making its way back to your mouth. You will find that the pain in your chest will steadily increase, making it difficult to swallow and perhaps even leading to asthma. Last, but by no means least, the acid in your mouth will start to corrode your teeth. There is no need to panic though, as acid reflux can be cured, although by which method will depend upon how severe it is. The lower esophageal sphincter (LES) is a valve that controls the flow of acid between the stomach and esophagus. When it becomes damaged, the acid cannot be controlled properly and will head for the esophagus, which in turn causes the burning sensation felt in heartburn. 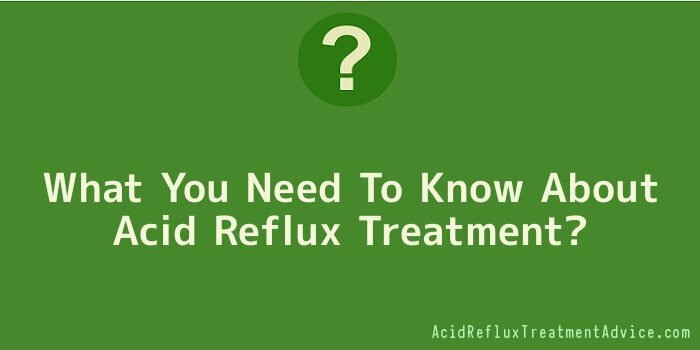 The treatment of acid reflux is usually done through medication, although surgery is sometimes required. Both treatment methods are designed to completely eliminate all traces of acid reflux. Antacids are the most common cure for acid reflux and they are available in both tablet and liquid form. They are best taken about 30-60 minutes after a meal, with the liquid antacid considered by many to be the easiest to consume. There are also acids that create a foam barrier inside the stomach that will not allow stomach acid to penetrate. In order for it to work at its best, you have to be sure to chew the tablet so that all the good stuff is released into the stomach. There are other medications that are used to build up the LES muscle, which in turn reduces the chances of acid reflux. As you can see, there are several options, but none of them should be pursued until you have discussed your acid reflux issues with your doctor. He or she may also recommend a change in diet to go along with the treatment they believe is best for you. If you are experiencing regular bouts of acid reflux, then you should consult your doctor before the condition worsens to the point where you need surgery. A proper diagnosis will help you get the treatment that will work best for your level of acid reflux.